Ah...summertime. Warm weather, pool parties, barbecues, and bugs. Lots and lots of bugs. Few things can turn a summer day into utter misery faster than a swarm of flying insects. You've tried greasy bug spray, citronella candles, Tiki torches, maybe even blowtorches. So we can imagine your surprise when you saw a yellow-colored "bug light bulb" at your local hardware store. Could it be true? Could screwing in a light bulb solve your bug problems for good? To answer that question, let's start by clearing up some myths about yellow incandescent bug lights and their energy-saving cousin, compact fluorescent bug lights. Bug lights do not kill bugs (you'll need a bug zapper or Paraclipse fly trap for that), nor do bug lights repel bugs. 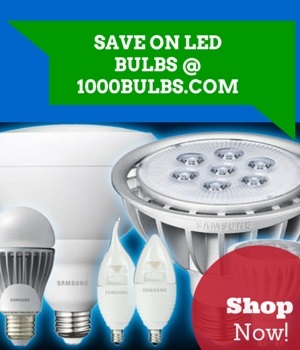 Bug lights simply attract fewer bugs than other light bulbs. In short, a bug light will not magically solve your bug problem, but it will make you and your home less visible to most flying insects. As discussed in a past article, light is divided into multiple wavelengths, measured in nanometers (nm), as you can see in the graph below. The human eye can only perceive a small band of wavelengths in the light spectrum, from about 390 to 750 nm. Insects perceive a similarly small band of the light spectrum, though their band of vision is shifted further to the "right" of the spectrum than ours. In fact, any wavelength higher than about 650 nm is virtually invisible to most flying insects. So why are bug lights yellow? Wavelength and color temperature have an inverse relationship, which you can also see in the graph. As the wavelength of a light source decreases, its color temperature increases (as according to Wien's displacement law). Low color temperatures are red-yellow and exhibit a long wavelength, while high color temperatures are blue-violet and exhibit a short wavelength. By coloring a bulb yellow, then, the manufacturer has decreased the color temperature and in doing so increased the wavelength into a spectrum unseen by insects. That's the science of how bug light lights work, but the larger question is whether they are effective. From personal experience, I can say yes, they are. However, bug lights are not a panacea for all your bug problems. This is for a couple reasons. One is that not all insects are the same; different bugs see slightly different wavelengths. Second, no light source is made up of one, pure wavelength. Even an apparently yellow light may exhibit some shorter (and bluer) wavelengths that insects may still see. To get the most out of your bug light, remember this: The bugs aren't there because they like the light; they're there because they like the smaller (and tastier) bugs that buzz around the light. If these smaller bugs sense any light whatsoever, it won't be long before they buzz their way to bask in it. And once the small bugs are there, it won't be long before the bigger bugs follow. Once that happens, you have a bug party on your hands, light or no light. The best thing to do to avoid a swarm of bugs is to turn the light off when you don't need it. Have any additional tips for keeping bugs away? Share them in the comments below or on Facebook, Twitter, Google Plus, LinkedIn, or Pinterest. We regularly get a large number of comments asking us about LED lights and how they mitigate bugs. To help out, we've written a new article to give a more in-depth answer on whether or not LEDs help with insects at night!